Lab Scale Casting Machine is Perfect for R&D! New Lab Scale Casting/Coating Machine is Perfect for R&D! 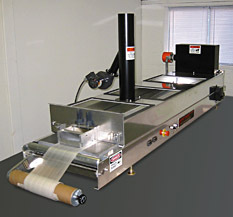 The new Pro-Cast Series Lab Scale Tape Casting/Coating Machines offer a simplified and inexpensive forming method for product development, research, and quality control. The new machines are the latest in the popular series of casters and coaters from HED International and are simple to use yet sophisticated enough to provide a versatile research and development platform. The Lab Scale Machines are designed with an enclosed drying chamber and removable tempered glass view-ports for ease of product access and visual inspection. Precision casting and coating applications are accomplished with a calibrated doctor blade set on a solid granite plate. Independently controlled heaters and an exhaust fan are provided for counter-flow circulation and dynamic management of the drying process and vapor removal. 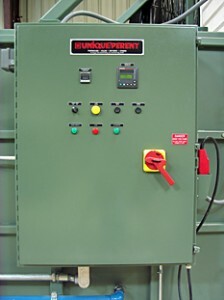 A variable speed drive with both carrier payout and removable take-up spools are also included. At less then 10′ in overall length, they are suitable for either tabletop or freestanding installations. Each machine comes complete with an integrated control system, wired and ready for immediate operation in your facility. A variety of custom options are also available. Developers who successfully produce prototypes on the Pro-Cast Series Lab Scale machines can be confident that similar results will be produced when they transition to the larger scale Pro-Cast production machines. HED International, a leader in the design and manufacture of processing systems, has installations worldwide used in the production of advanced ceramics, fuel cells, rechargeable batteries, capacitors, electronic materials, thermal plastic adhesives and other tape cast products. HED International, TOP GUN, elevator kilns are designed for a wide range of premium, quality high temperature ceramic products. The kilns are available in standard sizes from 24 to 45 cubic feet capacity. Operation is with gas, oil or electric dependent upon the technically optimum method of firing the product. The HED International clear objectives of improved performance, reduced maintenance, and overall simplicity have been achieved by a variety of means. 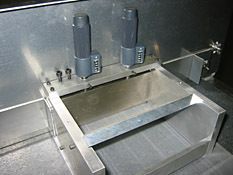 Two zones of temperature control are provided to insure superior uniformity throughout the entire product setting space. The fuel fired kilns are equipped with specially modified high velocity burners to provide smooth temperature control between 100 C and 1700 C, or even higher with oxygen enrichment. 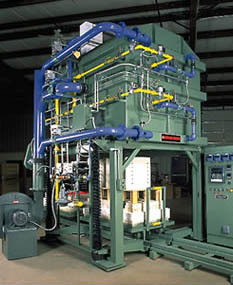 The TOP GUN series of kilns make use of proven, non-proprietary, readily available combustion components to provide for economical maintenance when required A water-cooled base section, with alloy construction for lifetime performance, is employed to provide the required high temperature seals. Low maintenance kiln cars are constructed with a proven interlocking refractory design. Because the ISOMAX combustion system is divided into two zones, top and bottom, the heat input is regulated to provide the highest degree of uniformity, in spite of load variations. Individual thermocouples placed at high and low elevations within the firing lane independently and continuously monitor the output of each burner pair. Generously sized fire lanes with high velocity burners cause vigorous internal recirculation, to further augment temperature uniformity. The spent combustion gases leave the kiln through a shielded crown slot, thereby reducing the amount of free radiation out the stack which in turn improves temperature uniformity and reduces fuel usage. During the heating portion of the cycle, both air and fuel are varied and separately controlled for superb flexibility of the firing environment. For the fastest cooling cycle, burner-cooling air is injected into each fire lane under complete control. Auxiliary air is also added during the final segment for additional cooling power. Operationally, this system offers the finest in precision heating and cooling of technical ceramics. The continued trend toward the development of advanced ceramic materials and related products has resulted in a greater need for reliable, specialized high temperature kilns. In particular, gas fired high temperature periodic (GFHTP) kilns are commonly used to process engineered alumina ceramics for applications such as semiconductor manufacturing equipment, microelectronics, and biomedical devices. These GFHTP kilns typically fire to temperatures between 1550°C and 1820°C and can range in size from 0.2 cubic meters to as large as 50 cubic meters. Standard features include a very low 60°C startup and hold capability, excellent temperature uniformity throughout the kiln including +/- 5°C at low temperatures and approaching +/-1°C at elevated temperatures, and the ability to precisely control the kiln atmosphere between oxidizing and reducing conditions. These features make the GFHTP kiln an important part of many advanced ceramics production processes. In addition to the demands of emerging technologies, advances in refractory materials, combustion components, and control systems used in GFHTP kilns have also brought about further improvements in the firing process. Moreover, engineering know-how, manufacturing experience and technical support are much more critical for a new GFHTP kiln installation than traditional thermal process systems. While there are applications better suited to continuous processing or electric radiant heating, in general, those high temperature processes that require the best possible temperature uniformity, firing flexibility, and production efficiency will find the modern GFHTP kiln a good fit. The most common GFHTP kilns are box, elevator, bell, and shuttle type designs. Factors such as setting space needs, firing turnaround time, factory floor space, financial constraints, and personal preference will influence the decision to choose one type of GFHTP design over another. From the process perspective, setting size is an important consideration when choosing the kiln type. For example, temperature uniformity is excellent in a front-loading box kiln up to 0.8 cubic meters after which limitations of burner configurations as well as loading restrictions become limiting factors to performance. In sizes up to 6 cubc meters, elevator kilns offer excellent temperature uniformity by providing more possible burner configurations, loading flexibility, and kiln car sand seal system. Bell type designs offer the greatest temperature uniformity in relation to overall kiln size because they utilize a downdraft exhaust system that greatly reduces the thermal losses that occur in updraft systems. Bell kilns recently supplied for technical applications in the 50 cubic meter sizes have provided temperature control within +/-1°C from cold to soak. However, these are design generalizations, as both box, and elevator types may be designed with downdraft exhaust and recuperator systems. In addition to the setting size, the density and overall weight of the product, the method of loading and unloading the product, and the length of the firing cycle are also important considerations when selecting the kiln type. 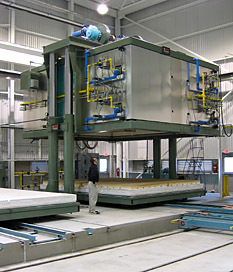 Box kilns are better suited for small production cycles or research and development firings in which the product can readily be loaded and unloaded by hand. Elevators offer the best of both worlds, providing both versatility and production capabilities. Bell Kilns are ideal for volume production of technical ceramics and product loads that are especially large and heavy. Manufacturer’s of technical ceramics continue to make products that push the envelope of materials engineering. These products are much more expensive per cubic centimeter than their traditional ceramic forbearers ever were, and the firing process requirements are far more demanding and critical. Fortunately, the modern gas fired high temperature periodic kilns is meeting those requirements today. New Energy Saving Electric Car Bottom Shuttle Furnaces! HED International introduces the new Heavy-Duty UPK Series of energy saving electric car bottom Shuttle/Bogie Heath Furnaces. Designed for debinding and sintering or other heat treatment requirements, the new UPK Series furnaces utilize quick cooling and residual heat to provide faster firing and rapid recycling. 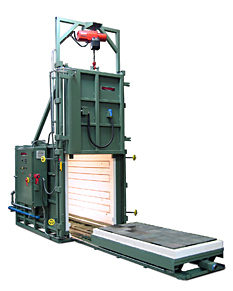 UPK Series furnaces are available with one or more cars or bogie hearths that are readily accessible for loading by several people or material handling equipment for heavy workloads. This allows the furnace to be firing one bogie while another is being loaded. Extra heavy duty welded steel shell finished with heat resistant enamel paint and COOL SKIN double wall sidewalls that minimize exterior surface temperatures. Electric heating elements distributed on the interior sidewalls provide uniform heating and long service life. Temperature control is programmable with SCR power regulation to precisely control heat-up rate and set point with roof dampers that enable rapid cooling. A duplex type thermocouple is provided for operation control and over-temperature limit safety shut-down. Electrical components include a door safety switch, and main control panel safety circuit breaker. The entire system meets applicable NFPA, NEC and CE directives and is completely wired ready for operation after connection to the required electrical service.